An Orange County native, Kristin started riding with her mom as a young child and began her show career at 7 years old. As a junior rider she competed successfully in the hunter and equitation divisions at shows throughout the state. She was an active member and competitor in Pony Club and Orange County IEL. Kristin has competed successfully in the junior/adult amateur divisions.She then advanced into becoming a professional rider in 1999 and built a substantial show record at local and nationally ranked competitions. Kristin has worked with trainers such as Ali Nilforushan and Mandy Porter. All of this experience helped build the skills and understanding of good horsemanship that enabled Kristin to become a trainer in her early 20s. 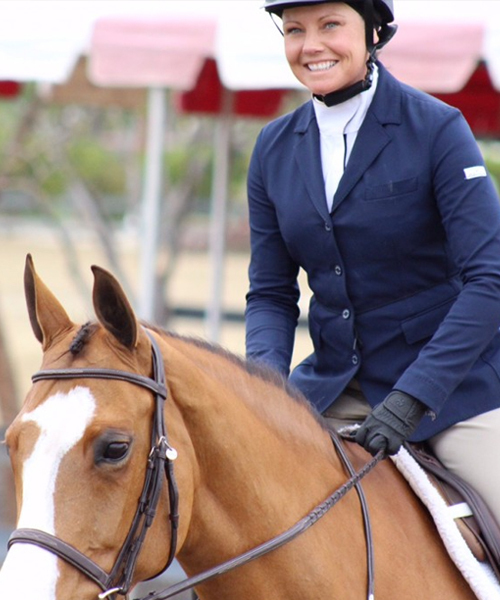 At PepperTree Equestrian, Kristin works extensively with each of her clients to custom tailor a riding program that meets their ability and growth potential as a rider, as well as determining the abilities of their horse. This program is reviewed and adjusted at least quarterly to insure every rider’s success. Kristin not only looks at a rider’s progress in the ring or at a show, but she also identifies other growth-building programs such as the USHJA Emerging Athletes Program or clinics with well-known professional riders. Additionally, Kristin feels that a well-mounted rider is critical to success and has the keen ability of finding just the right horse for a perfect fit to the rider. She is very familiar with the international horse market and travels in the U.S. and Europe, purchasing top quality show horses that will be competitive in today’s show ring. Jackie Lefave was born in Kansas city, Kansas but shortly after she was born they made their way to Arizona where they discovered her love for horses. At the age of 8 years old her father got relocated to California and this is when her riding career started. Jackie had her first lesson at Sycamore Trails and she never looked back for the next 24 years. It soon went from a hobby to an obsession. As the years passed Jackie competed successfully as a Junior and Amateur Rider and at the age of 20 Jackie took a leap of faith and became a professional. She has since then worked with many outstanding professionals where she has bloomed as the rider she is today. When Jackie joined Peppertree two and a half years ago she discovered what a passion she had for teaching. She thrives on sharing her knowledge so she can see her students succeed within the industry. It is her dream to help every rider become the best at their discipline. She understands that a coach is someone who always makes you do what you don’t want to do so you can be who you always wanted to be. She hopes in the future she can make other peoples dreams become a reality because thats exactly what she did herself.